Computer interactives, augmented reality, video screens and touchtables, digital is increasingly occupying gallery space as a means of engaging audiences with museum content. Museums are experimenting with new technologies to capture audience interest and deliver deeper interpretation. But while the technology for delivering interactive engagement becomes more sophisticated, are the principles different to those of low-tech interactives such as handling collections, replica costumes and ‘lift-the-flap’ activities? Technology aside, how do digital interactives differ from their low-tech counterparts? Oxford University Museums Partnership will be exploring this issue at a one day conference in Oxford on 22 July 2015. We are inviting colleagues from across the sector to present their best in gallery engagement initiatives, both digital and analogue. We want to hear about image recognition apps and paper detective trails, costumed characters and virtual reality villains, Bluetooth beacons and cardboard cut-outs. Does bot-written note in your handwriting look like it’s from uncanny valley? But does a note in your handwriting done by a bot look like it’s sent from uncanny valley? 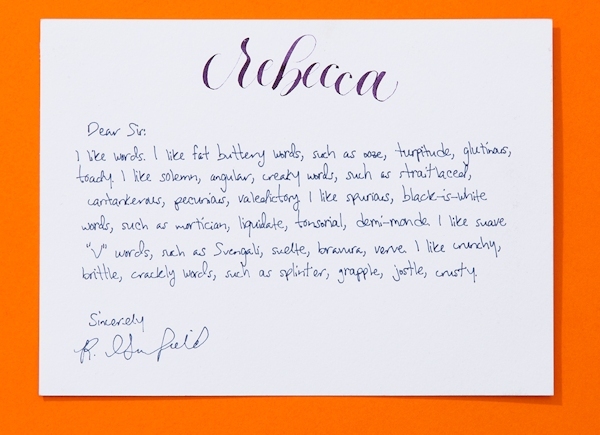 We test out letter-writing company Bond to see. Sitting on my desk is a lovely note, written on thick, customized stationery with my name scrawled across the top. It’s in my handwriting, but I didn’t write it. A robot did. Looking closely, I can spot some slight differences between the bot-generated lettering and my signature scribble. The penmanship is cleaner, more methodical, a little too consistent. But even with those disparities, the words capture my essence. To anyone else, it looks like I took the time to hand write a thank-you note, when really a machine took words I typed and, like a prosthetic arm, moved a pen up and down the page to write just like I would. The bot comes by way of Bond, a company looking to take the hand out of hand-written letters. “We think there’s a lot of friction points when it comes to doing something nice for someone else,” Sonny Caberwal, founder and CEO of Bond told Fast Company. New York-based Bond initially launched in 2013 as a gift-giving service with a less adept note-writing bot. The company transitioned to just notes this November, after recognizing how much people liked the personalization aspect of the business. If you’re lucky enough to fly in first class, your pointy end long-haul flight is about to get even fancier. Qantas is going to be using the Samsung Gear VR, and the accompanying Galaxy Note 4, for in-flight entertainment for its first-class customers. 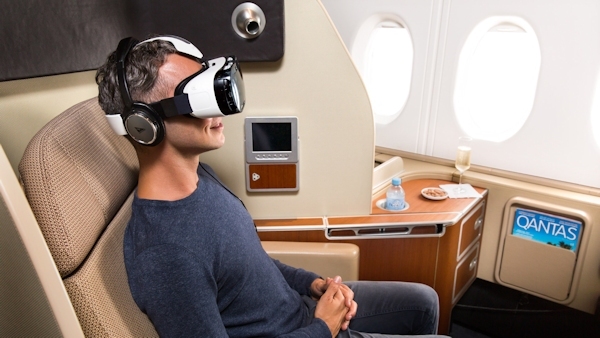 Starting out as a pilot program on Qantas’ LA to Sydney and Melbourne to LA flights, where the Aussie carrier uses both Airbus A380s and Boeing 747s, the Samsung Gear VR will be offered to first-class passengers to enjoy Qantas-created 360-degree videos and other content. Around a dozen Gear VR headsets and Galaxy Note 4 handsets are being used for the initial partnership — four on the outbound flight, four on the inbound flight, and two each for Qantas’ Sydney and Melbourne first-class passenger lounges. The 2015 Games and Software Engineering workshop (GAS 2015) explores issues that crosscut the software engineering and the game engineering communities. Modern games entail the development, integration, and balancing of software capabilities drawn from algorithm design and complexity, artificial intelligence, computer graphics, computer-supported cooperative work/play, database management systems, human-computer interaction and interface design, operating systems and resource/storage management, networking, programming/scripting language design and interpretation, performance monitoring, and more. Few other software system application arenas demand such technical mastery and integration skill. Yet game development is expected to rely on such mastery, and provide a game play experience that most users find satisfying, fun, and engaging. Computer games are thus an excellent domain for which to research and develop new ways and means for software engineering. 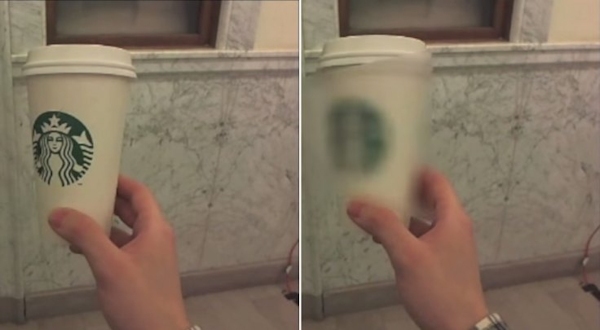 A new use for augmented reality headsets has been developed by students in the US using software that blocks brand’s logos in the real world. Brand Killer was designed and built by undergraduates at the University of Pennsylvania and uses similar technology to other virtual reality and augmented reality headsets, such as the Oculus Rift and the Samsung Gear VR. The Body, the Brain, Symbolic Expression and Its Experience: An Experimental Aesthetics Perspective. Cognitive neuroscience can shed new light – from its own methodological reductionist perspective – on the aesthetic quality of human nature and its natural creative inclination. By exploiting the neurocognitive approach, viewed as a sort of ‘cognitive archeology’, we can empirically investigate the neurophysiological brain-body mechanisms that make our interactions with the world possible, detect possible functional antecedents of our cognitive skills and measure the socio-cultural influence exerted by human cultural evolution onto the very same cognitive skills. We can now look at the aesthetic-symbolic dimension of human existence not only from a semiotic-hermeneutic perspective, but starting from the dimension of bodily presence. In so doing we can deconstruct some of the concepts we normally use when referring to intersubjectivity or to aesthetics and art, as well as when referring to the experience we make of them. A young woman stands in the middle of a crowd of protesters marching up a New York City street, shouting that she is fed up with police brutality, fed up with people saying that black lives don’t matter, fed up with people telling her not to be angry. You look to the left, and see protesters holding a sign reading, “White Supremacy Is Deadly.” Spin to the right, and you see a throng of observers, their expressions stern as the protest continues. 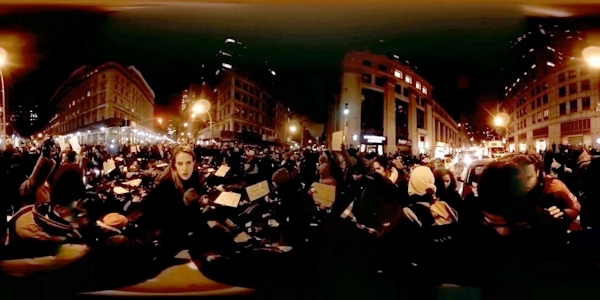 These vivid images are part of an eight-minute virtual-reality experience that catapults audiences into the center of the Millions March protest in New York in December. 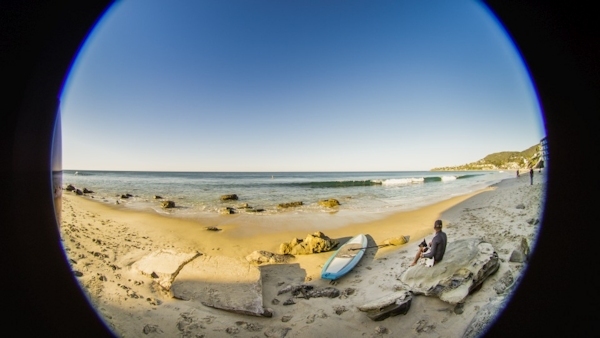 Created by two experienced directors, Chris Milk and Spike Jonze, in partnership with Vice News, the project is a virtual-reality journalism broadcast. It will make its debut on Friday at the Sundance Film Festival and in a new virtual reality mobile app called Vrse, which is available on the Vice News site. There are three options for experiencing the project at home. The first is a virtual-reality headset, like the Oculus Rift device. The second is with the Vrse app, downloaded onto a smartphone and connected to a simple viewer, like a cardboard one that Google designed to be built on your own. Finally, viewers can download the app and watch directly on a phone, which provides a close approximation of the experience but loses some of the 3-D features.